LONDON--(BUSINESS WIRE)--Technavio analysts forecast the global coconut flour market to grow at a CAGR close to 8% during the forecast period, according to their latest market research report. The increasing demand for gluten-free products is one of the major trends being witnessed in the global coconut flour market 2019-2023. The gluten-free food and beverages market has witnessed a significant shift over the last decade in terms of growth in consumption and purchasing power. Consumers aged 25-35 years and 50-65 years are the most influenced by the gluten-free diet, as the prevalence of celiac disease is most common among these age groups. The gluten-free snacks and baked products are the fastest growing segment in the global gluten-free packaged food and beverages market. Therefore, the global coconut flour market is expected to grow largely during the forecast period. The health benefits of coconut flour are the major reasons underlying the growing demand and consumption. Furthermore, coconut flour is a gluten-free substitute for wheat flour. Some of the advantages include high fiber content and high protein. Coconut flour contains nearly 5 gm of fiber per tablespoon, which makes it a rich, concentrated source of nondigestible fiber. This insoluble fiber adds bulk to food, enhancing colon health and helping to feel satiated. Also, Coconut flour contains a higher amount of protein than wheat flour. A 100-gm serving of coconut flour contains nearly 19 gm of protein. Therefore, with such advantages, the market is expected to register a positive outlook during the forecast period. The global coconut flour market research report provides market segmentation by product (conventional flour and organic flour), and by region (the Americas, EMEA, and APAC). It provides an in-depth analysis of the prominent factors influencing the market, including drivers, opportunities, trends, and industry-specific challenges. The Americas held the largest share of the market in 2017, accounting for close to 45% share, followed by the EMEA and APAC respectively. Although APAC held the smallest share of the market, it is expected to witness the maximum increase in its market share over the forecast period followed by the EMEA region. 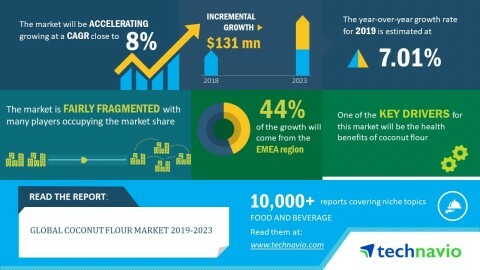 Technavio analysts forecast the global coconut flour market to grow at a CAGR of 8% during the period 2019-2023 according to their latest report.